Sandwiches and drinks courtesy of Cafe Mish. 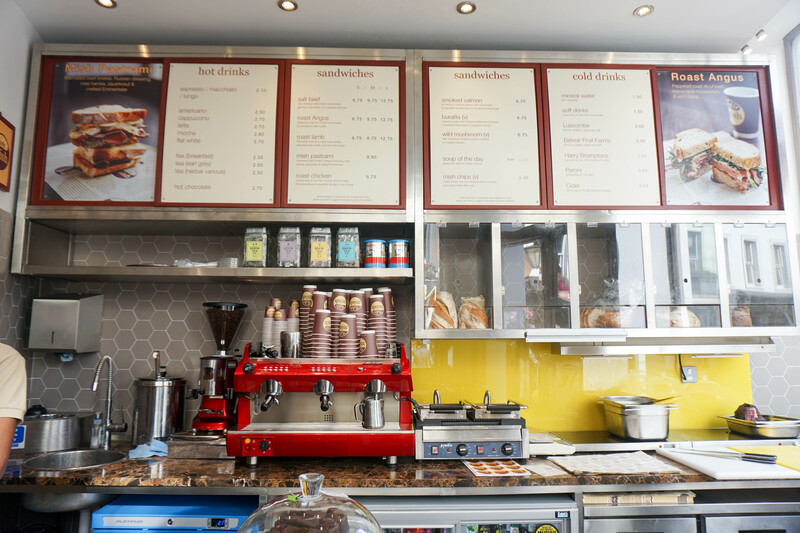 A cafe named after the owners – you’ll find freshly made, gourmet sandwiches in the bustling corner of 1A Shepherd Street, home to several local and friendly Mayfair pubs. Opened in July 2015, they were one of the hottest new openings, delving into new and unique niche market of high quality sandwiches sourced from H.Forman & Son, Johnson & Swarbrick and The Bread Factory. Using organic produce from these particular companies allows Cafe Mish to create a distinctive taste to sandwiches not known before. Cafe Mish serves up made to order sandwiches, with the meat carved in front of you as you ponder over a range of sandwiches to your liking. As well as sandwiches they offer enticing patisserie such as Caramel shortcake and Belgian Chocolate cake, although I didn’t try these, you can tell with one look, how finely made they are. Jujhar enjoys his Roast Chicken sandwich! Camera shy? The Mish chips took me by surprise, even though eating the sandwich alone was very filling, I couldn’t keep my hands away from the mixture of hand cut sweet potato and potato chips! The chicken sandwich consisted of corn-fed chicken with avocado, Romaine lettuce & espelette tarragon mayonnaise. You can taste the difference between the roast chicken here to the likes of its competitors. Free from additives and growth promoters, the chicken meat was succulent, and a natural, healthy texture on the meat can be seen. We were lucky enough to try a further two sandwiches, its signature salt beef sandwich, seemingly pricey with the L being £12.75. There is actually a reason behind this, as the meat is weighed according to how much you would like. We had a small sized one and realised just how much meat you get in one sandwich! The salt beef consists of slow braised salted beef, sweet pickle gherkins, dijonnaise on a caraway bloomer. Calling these sandwiches divine would be an understatement! I had the mish pastrami, a personal favourite, which consists of marinated beef brisket, Russian dressing, rose harrisa, sauerkraut and melted emmentaler. One bite of it and you can tell the bread is baked fresh, soft but taut enough to hold the insides. Soup of the day taster! Cafe Mish does quirky popcorn too. We had a taster of the soup of the day, zucchini, basil and parmesan. The soup was thick and held flavour, with strong aroma emanating from the cup. A definite filling and appetizing end to our evening. Service: We were served by Mish’s son who was here on a summer break! Great hospitality and very welcoming staff. They also have regular deals on so keep an eye out!